Family, friends, and activists gather in Tegucigalpa, Honduras, to demand justice for Berta Cáceres. Two years ago, a group of gunmen stormed into the home of Berta Cáceres in La Esperanza, Honduras, and fatally shot her. The death of the 43-year-old indigenous environmental activist—who won the Goldman Environmental Prize in 2015 for her work to block the construction of a dam on a river sacred to her Lenca people—shed an international spotlight on the dangers activists are facing throughout the world. Cáceres’ family and friends have been dedicated to finding justice for her death, and the Honduran government might finally be listening. On March 3, the second anniversary of her death, the Honduran police arrested Roberto David Castillo Mejia, the executive president of Desarrollos Energéticos S.A., the company building the dam Caceres was working to stop. Though eight others have been arrested, Cáceres’ friends and families have never stopped blaming Mejia and his company for her death. He allegedly “was in charge of providing logistics and other resources to one of the perpetrators already prosecuted for the crime,” the Public Ministry told Reuters. Honduran police arrest Roberto David Castillo March 3, 2018. When Cáceres was killed, Honduran authorities tried to say it was a robbery, or that her murder was a “crime of passion,” so this shift from the police’s narrative is encouraging for Zuñiga Cáceres—and it shows how far the country’s law enforcement has come in taking this death seriously. “It’s a significant change,” Zuñiga Cáceres said. However, there’s a lot left to do. Zuñiga Cáceres doesn’t want authorities to stop with Mejia’s arrest. He’s just one executive. An independent report published last year shows the Honduran government has had enough evidence since May 2016 to arrest an entire network of business executives and state officials for Cáceres’ death—something her family has been alleging all along. 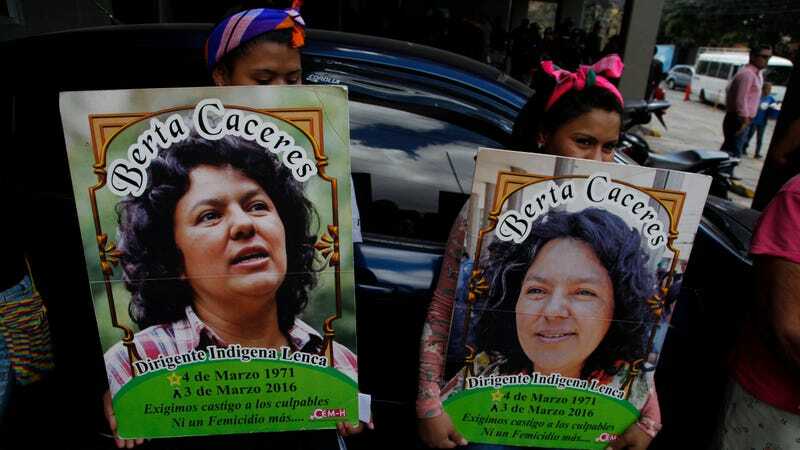 While Cáceres’ death has received a lot of (much deserved) attention, she’s far from the only environmental activist to meet a grim fate. In 2018, nine activists have already been killed, according to The Guardian, which tracks these murders. Last year, 197 environmental defenders were lost to violence—with indigenous communities hit the hardest. The year Cáceres was murdered, 200 others were killed, too. A group of 24 Latin American and Caribbean nations adopted a legally binding regional agreement Sunday with the hopes to stop these senseless killings. It’ll open up in September for countries to formally sign on, but they’ve at least agreed on a final text for now.